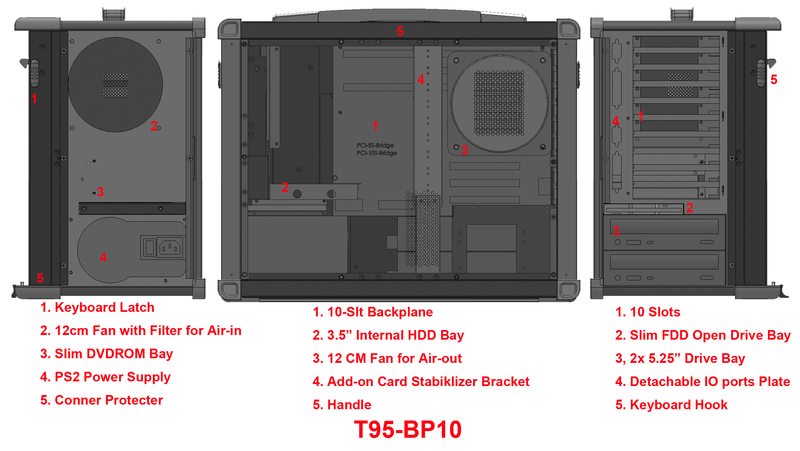 The Titan-T95 is a rugged portable computer enclosure that combines compactness, strength, and portability, providing the base to build high performance, state of the art PC systems with an upgrade path capability. Titan T95 is most model popular model of the titan series with its rugged chassis, 17″ LCD, ATX platform, 4 drive and 7 slots. The Titan-T95 is designed with the product’s overall strength in mind. It is based on a well engineered all-aluminum chassis surrounded by an all aluminum outer shell with shock absorbing composite rubber corner blocks. The built-in LCD screen is protected by a 3mm thick impact-resistant glass. The keyboard with built-in pointing device is environmentally sealed, offering protection against water, dust and accidental spills. The internal 3.5″ drive bays are shock-mounted to protect the hard disk drives from damage. It provides protection to the computer unparalleled by any other chassis. TitanT95 offer an expansion capability rarely matched by other portable computers. Solutions can be easily customized for the majority of portable computing applications where there is a requirement for add-in PC card capability, massive disk drive expansion, and the ability to survive harsh conditions. 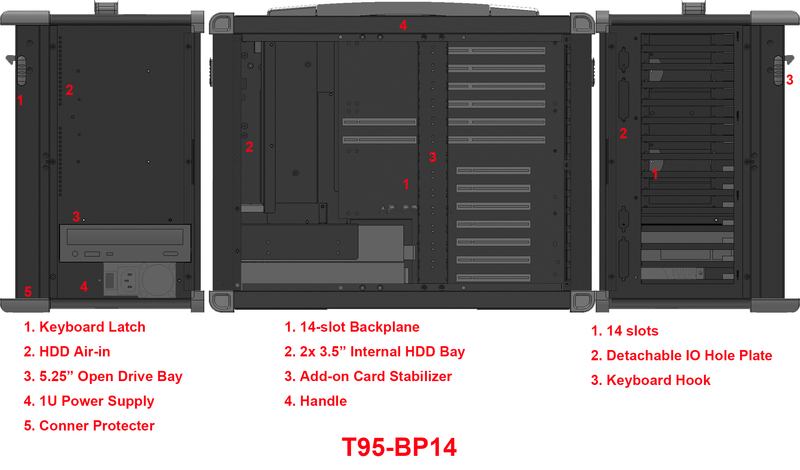 The Titan-T9xoffers seven expansion slots and four open drive bays, the ability to accept the fastest CPUs from Intel(R), and is capable of SCSI sub-system. The key to cost effectiveness and flexibility The Titan-T95 uses standard off-the-shelf components to optimize price without compromising performance. 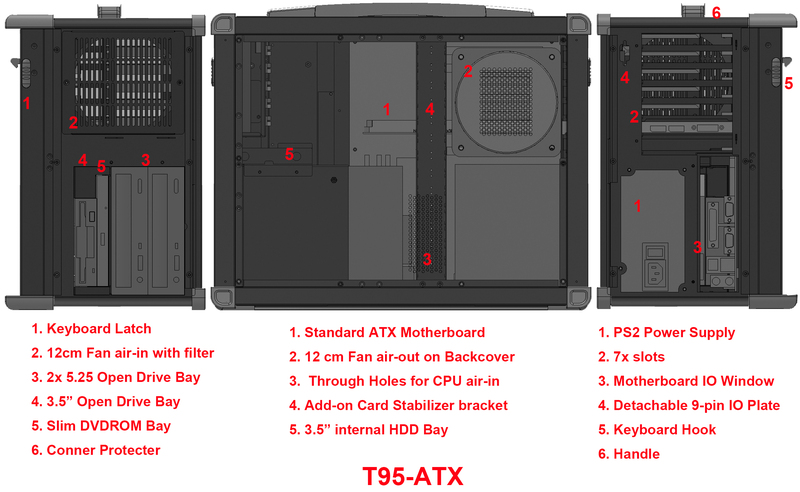 It supports most standard ATX motherboard and passive backplane with 7 or 10 slots for superb expansion capability.